Bottle of Wine Glass - Moar Stuff - You don't need it but you know you want it. 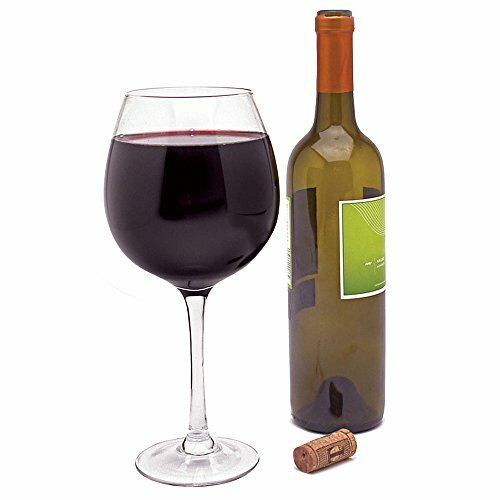 Extra Large Wine Glass holds an entire bottle of wine, up to 750ml. Pour in your favorite red wine or white wine, a whole bottle of wine at at time! This fun wine accessory is a great gift for any wine enthusiast and would be a perfect addition to for making a wine gift basket. Mix with other DCI wine accessories and add with a bottle of red wine or white wine for the perfect gift baskets of wine! 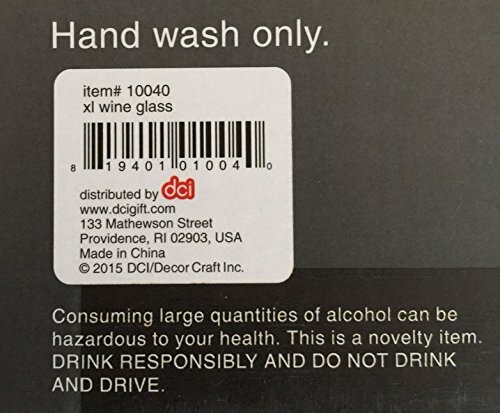 DCI XL Wine Glass is a perfect Christmas Gift, Birthday Gift, or Retirement Gift. Your friends and family will get a good laugh out of this unique wine glass. Made of high quality glass, this wine glass is recommended to be hand washed. Our glasses will be the hit of the party whether you need a 21st Birthday or 60th birthday party gift, gift for a bridal shower, an anniversary gift, gift for parents, a Christmas present or stocking stuffer. The glass comes in attractive packaging ready to be gift wrapped (actual packaging may vary slightly from shown). This Bottle of Wine Glass is not just a play on words. It’s also my favorite vessel for every type of wine. Why? Well, probably because it will hold an entire 750ml bottle of wine and not be overflowing. It’s perfect for when you say you want just one glass but, you really want the whole damn bottle. Hey, I’m not judging. I have those days all the time. Usually after dealing with an irate or incompetent co-worker all day. Actually, come to think of it, it’s always after dealing with an irate or incompetent co-worker all day. The large wine glass can also be used as a unique vase centerpiece filled with candy, fruit, seasonal decor, decorative items or as a wine cork holder. If you are looking for a funny gag gift for a friend or co-worker, or a gift to yourself, the Bottle of Wine Glass is a fun gift that will turn heads but also is surprisingly functional! Dimensions: 4 x 4 x 9 inches. When you say you only want one glass, why not have the whole bottle? Now you really can tell your doctor you only have one glass a day and not lie.